What kind of techniques are used for fossil drawings? How are this drawings made when the soft tissues do not leave a trace? When every single artist can draw the same material in different ways, how can we trust these paintings? First of all this topic is really far-reaching and really entertaining, though the fun and entertaining does not interfere with the gravity of it; the truth is the scientific artists are working like detectives and collect every bit of data to get the best result. Let's have a look on the breath-taking life of a scientific artist. Like the question states, unfortunately except for some extreme cases (like resin fossiles) the soft tissues cannot be found on a fossil. Therefore, the recovered bones are analized on every detail and from the findings and comperative methods, the organism is reconstructed. Those people who make a living of that are called science artists. These people differ from normal artists because they live hand in hand with science and most of them are professional or amateur scientists. These artists are responsible of transforming their studies of the fossils and the knowledge from specialists to paper. It is not only organisms but sometimes places they have to reconstruct on a drawing (like New York City, 700 million years ago) and sometimes both places and organisms are drawn in one picture. The job is on the basis similar to forensic artists that work with the police. They use the data from witnesses and evidences to draw a possible portré of the suspect. The main components are not only the talent of the artist but also the data of detectives and their ability to make assumptions. As you know it from movies or real life, this drawings are pretty accurate and are very much similar to the original. At this point we would like to mention two definitions: Restoration, is a process used to complete the missing parts in a fossil. It is usually based on the completion of anatomical relations and the missing components of a fossil. For example you can find out the anatomy of a specific bone by just investigating the anatomy af another adjacent bone and the joint structures even if you do not have the fossil of that specific bone. This process is made by scientists and artists. Reconstruction, on the other hand, is the process used to find how the organism whose fossil is found in hand, looked like when it was alive. Restoration is usually made on vertebrates, because that all bones of a vertebrate becoming fossilized is rare. The invertebrates' bones are usually all preserved. This is because of the movement amount which causes the odds for vertebrate to die on a "good spot" is just to small. But thanks to the bilateral symmetry of the vertebrate finding just one side is enough to restorate the other part of the body. Research begins with the conversation between the scientist and the artist. The scientist gives the basic knowledge to the artist: the age, the region, the climate and the environment around the fossil, the possible other species which may have interacted with the fossil, the scientists view of the stage/place, materials in the example, photos, scientific definitions and articles about the subject, and all kinds of background information. If known, the relatives of the fossil or the evolutionary history are explained to the artist in full detail. Actually this stage continues throughout the drawing process and is used as a feed-back mechanism. Another important point is this: sometimes, some findings can give you more information then you can imagine. This is amongst scientists a normal and usual occurrence; but it is hardly imaginable for other people. For example during his voyage with the Beagle, Charles Darwin found out several characteristics about an extinct organism and made a species analysis based on just one tooth fossil he found. Later this tooth was examined by several experts in England and proved Darwin's assumptions to be right. It is really possible to find out about the diet, environment and size of an organism based on a tooth's size, shape and characteristics. As the artist has enough information, after a period of processing and analizing the information, it is time to begin drawing. This composition contains the general environment, light levels and possible other species and landmarks. If it is just one organism, a drawing based on the fossil and the acquired information is prepared. Later the scientist makes the needed comments and evaluations. The point we want to mention is this: Anatomies of living beings are alike and taxonomy is really useful in this job. For instance, the mammals' bones and muscles are in a direct proportion which on leads to the body mass. When compared, a mouse is just like a small model of a whale. The muscle/bone ratio is similar; a mouse is just like a "compressed whale". On the other hand, the organs structure may have changed due to evolutionary processes but this can be discovered while analyzing the fossiles. Like we said a tooth, a bone's location or stance can give an scientist hundreds of informations. Usually the painting is made with acrylic paint, which is the best paint in covering mistakes. Usually in the orientation of an scientist necessary corrections are made on the drawing. Coloring is based on the environment of that age. To reduce mistakes, charcoal drawings can be used too. The easiest way for colouring is comparing the colours of modern relatives of the fossil. Usually this stage is based on the modern relatives or known old environment to reduce possible mistakes. On every stage and nearly on every single brush the scientist and the artist will criticise the drawing. Colors are edited, sizes are calibrated, the accordance between reality and drawing is analyzed, etc. Step by step the necessary arrangements are made. Usually the drawings are shown to other scientists for their opinion about the accuracy of the painting. Sometimes several groups prepare their own paintings independently and compare their work with others to determine the most accurate one. To conclude, the reconstruction of a living being from a fossil is a delicate and extensive business. Scientists never base their claims on "lies" or "make-up things" and even if a painting is incorrect, it does have its reason why it was painted that way. Sometimes non-scientific sources and usually the enemies of science accuse scientists and artists with meaningless and wrong words such as "All this drawings are different from each other, this scientists are making things up". Trying to humiliate evolutionary biologists and science itself are the meaningless claims of such sources nothing but noise. The differences in different drawings are from the different interpretations of the information and not because the scientists are making up stories. A smart human being should consider the truth and learn science from scientists. All this drawings are based on such complex methods which we cannot explain here; do not forget, this is science. Therefore the drawings are to fit the scientific methods. This method is objective and trustworthy. To name a few scientific methods in reconstruction: Homologous Reference Point Method, Thin Plate Spline Morphing, 3D Morphing Processes, Numerical Methods, Stereolithography, etc. S. Lautenschlager. (2016). 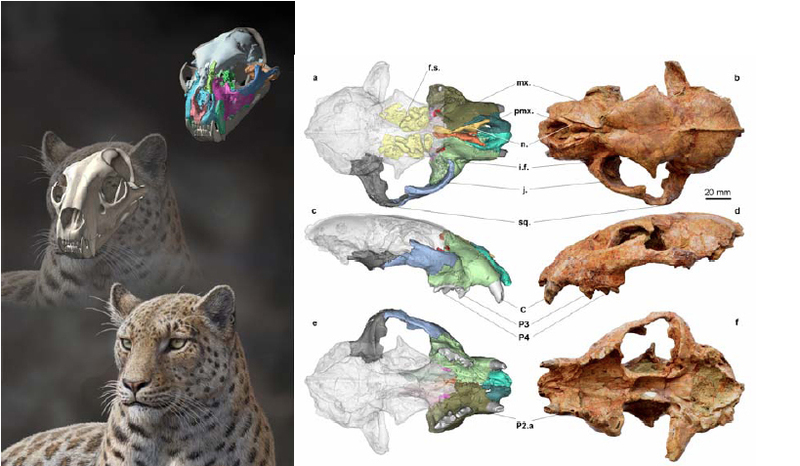 Reconstructing The Past: Methods And Techniques For The Digital Restoration Of Fossils. Royal Society Open Science.